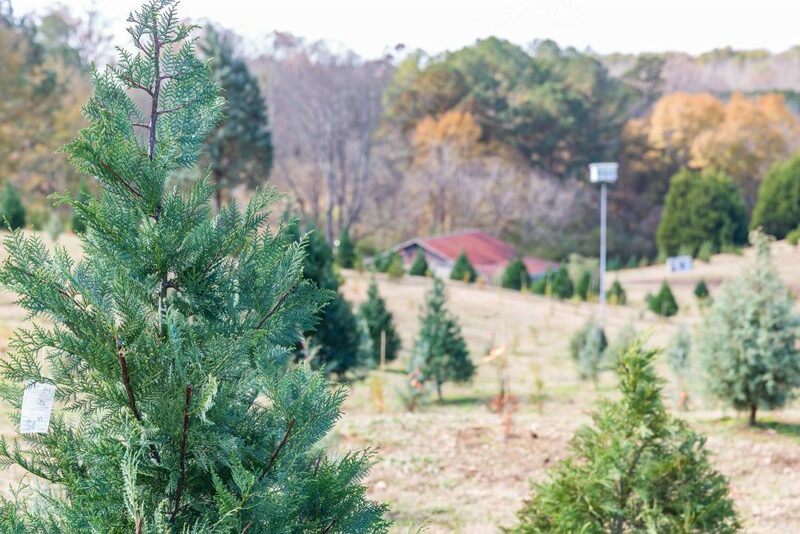 Tucked away in North Jefferson County in Tarrant, Alabama lies a 15 acre farm that grows Christmas trees all year long. Most probably don’t know the farm is located there and many probably pass by the farm’s sign on North Pine Hill Road. But if you want a traditional Christmas experience and a Christmas tree grown with care and love, then Pine Hill Farms offers that and more! Pine Hill Farms trees are grown with love and care by Cary and Carley Walker. 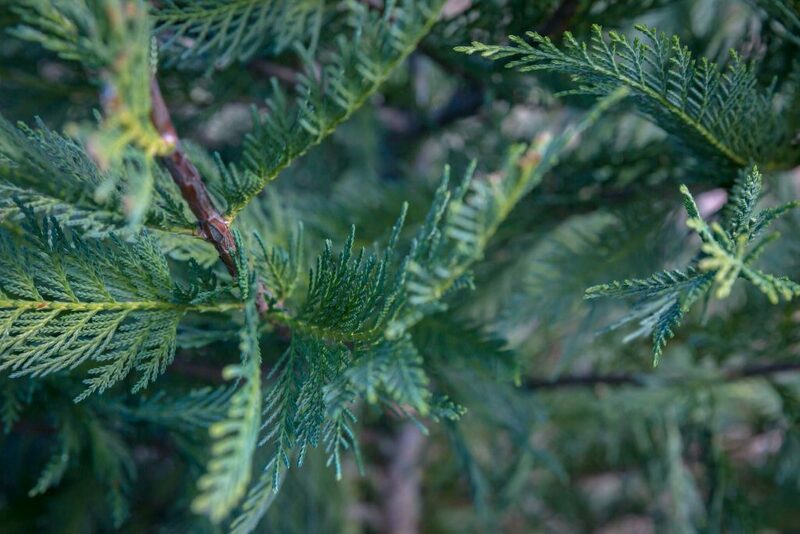 What Makes Pine Hill Farms Trees Special? Owners, Cary and Carley Walker have lived on the tree farm for over 50 years, but they say it’s more than about the trees, “it’s about families and holiday traditions.” The Walkers see a number of young families coming out every year to give their children the experience of picking and cutting a family tree. Carley told the story of a young woman who worked on the farm many years ago while in high school returning to the farm with her family to pick a Christmas tree. Pine Hill Farms opens every year on Nov. 17 regardless the day. Over the years the Walkers have built relationships with people who return to Pine Hill Farms each year to buy their tree. 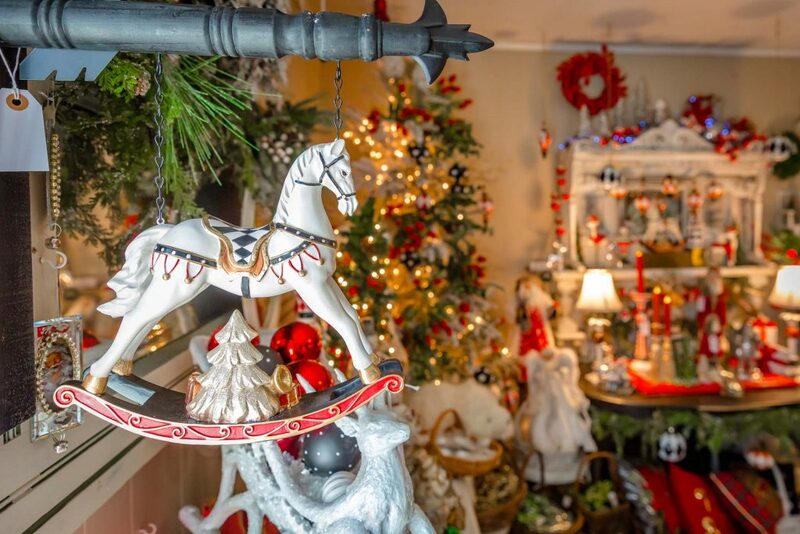 The farm opens for the holiday season on Nov. 17 annually regardless the day of the week. The first tree they delivered this year was to Pepper Place, a customer of Pine Hill Farms. The Walkers grow 5000 to 6000 trees on the farm every year, and say it takes about four years for a tree to mature into a tree that is ready for cutting. They also say that growing the trees is a labor of love. The time and care they give to the trees are what makes them special. Their trees are grown in pots first before they are planted into the ground. “The trees have to have proper irrigation and fertilizer,” Carley added. 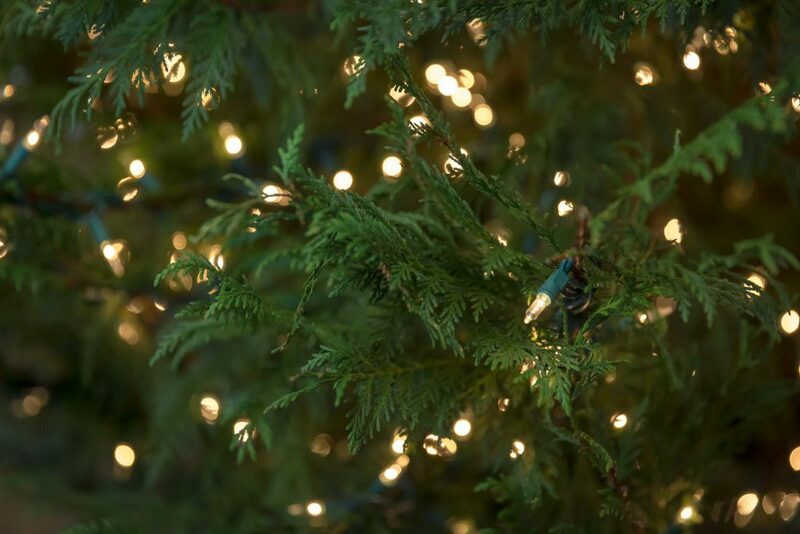 Pine Hill Farms offers a full-service Christmas tree service. They will put the lights on the tree for you! 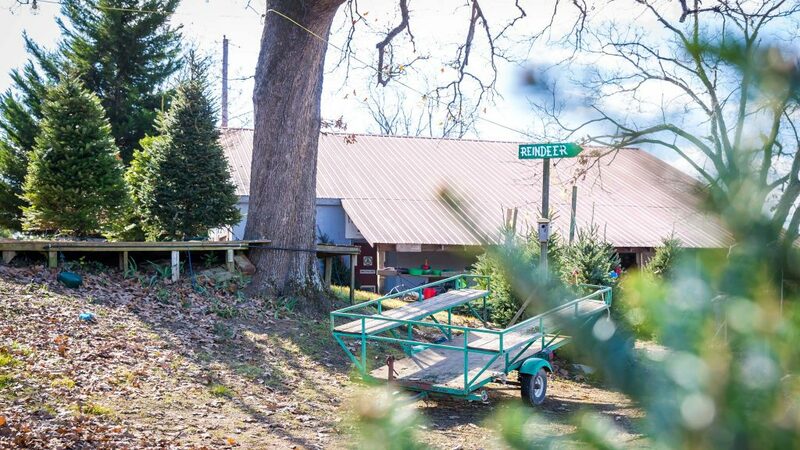 What’s unique about this tree farm is that they offer a full-service Christmas tree service, which means you can cut a tree directly from the farm, have it flocked with snow or have the lights installed on it while you wait. There is an option to have your tree delivered to your home, set it up and even dispose of it after the season. 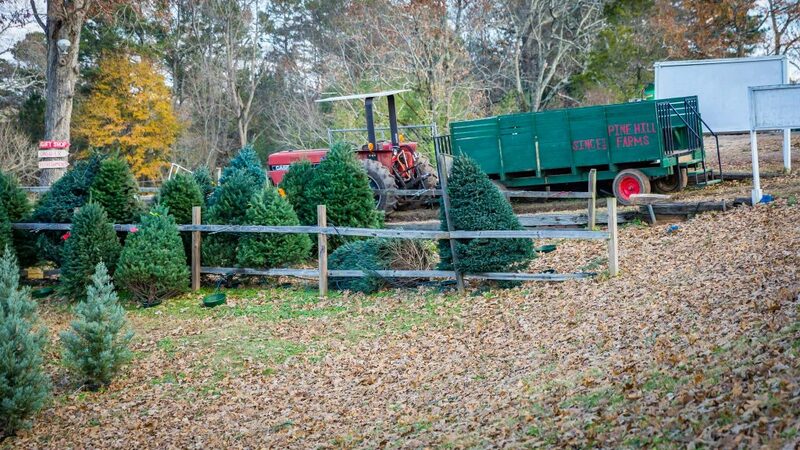 Rows of Christmas trees can be found at Pine Hill Farm. Families can find the perfect tree and cut it. 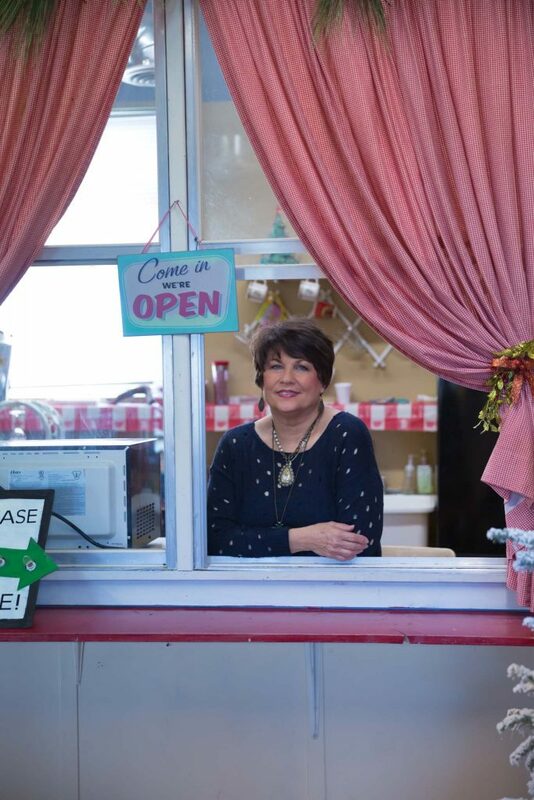 When you arrive at Pine Hill Farms, you are invited inside for a cup of hot apple cider, coffee or hot chocolate. Beautifully fragrant trees, some flocked others not, line the walls of the room where you pick out your beverage. We highly recommend the hot apple cider. The cider has a unique flavor and is made from a secret family recipe; one that we won’t divulge! You have to visit Pine Hill Farms to try it for yourself. After you have your cider, you can shop in the Christmas shop or go on the farm to pick out your tree. 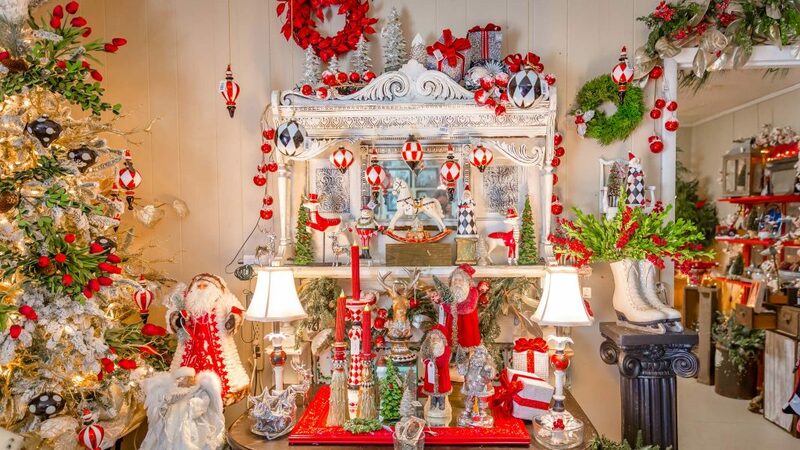 Carley Walker personally picks out all of the Christmas ornaments and decor found in the Christmas Shop. The theme changes each year. You don’t want to miss the Christmas shop! Carley personally chooses the unique gifts and ornaments that are available in the shop and she changes the theme of the shop every year. 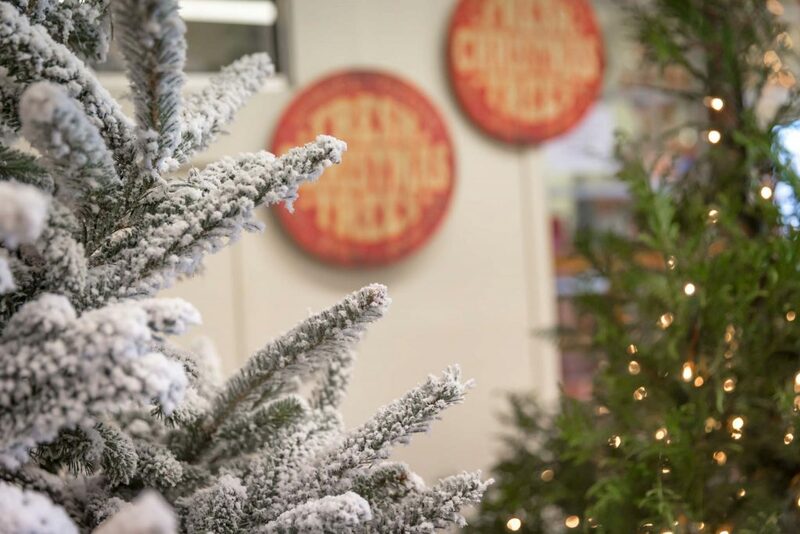 The shop is adorned with live trees decked out in this year’s theme. 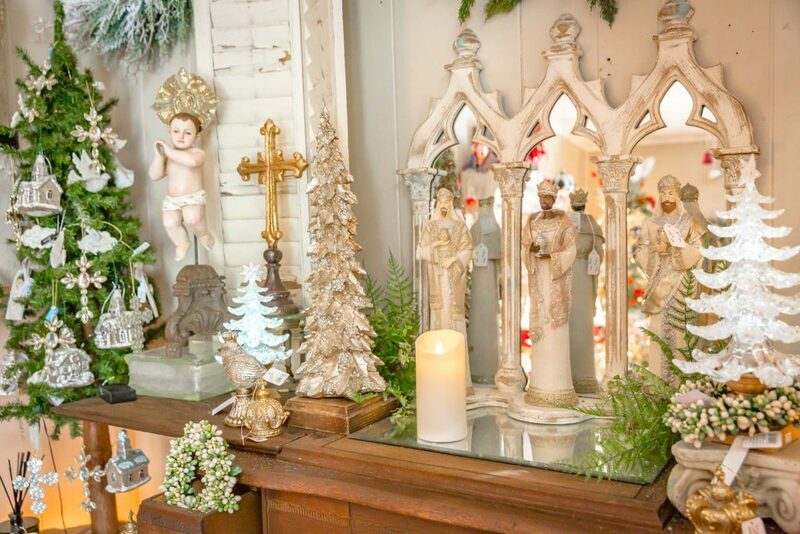 The shop also offers unique Nativity displays and ornaments. The Christmas Shop has a great selection of gifts and ornaments with a particular holiday theme. 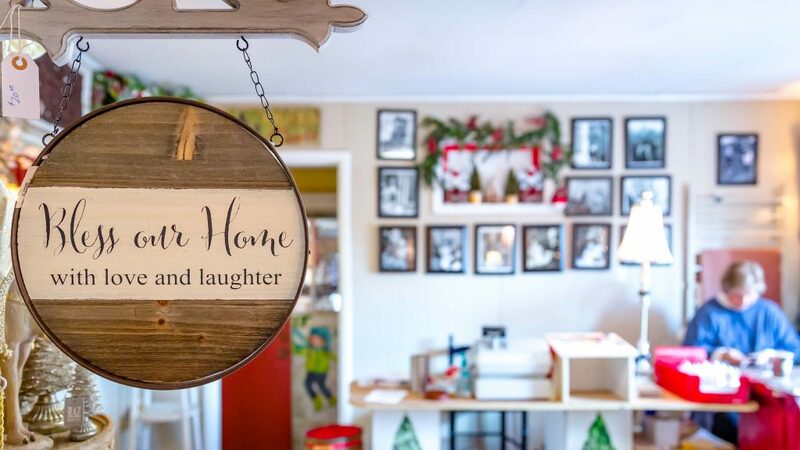 Above the cash register is a series of black and white framed photos showing the history of the Walker family Christmas, including the trees with the silver icicles. The Christmas Shop has a good selection of Nativity scenes. Over the 15 acres there are rows and rows of trees available for people to cut. Cary Walker will give you a ride on the back of his tractor if you don’t want to walk to find your tree. Part of the fun, however, is walking the rows to find that perfect family tree! Cary Walker will offer you rides on his tractor. 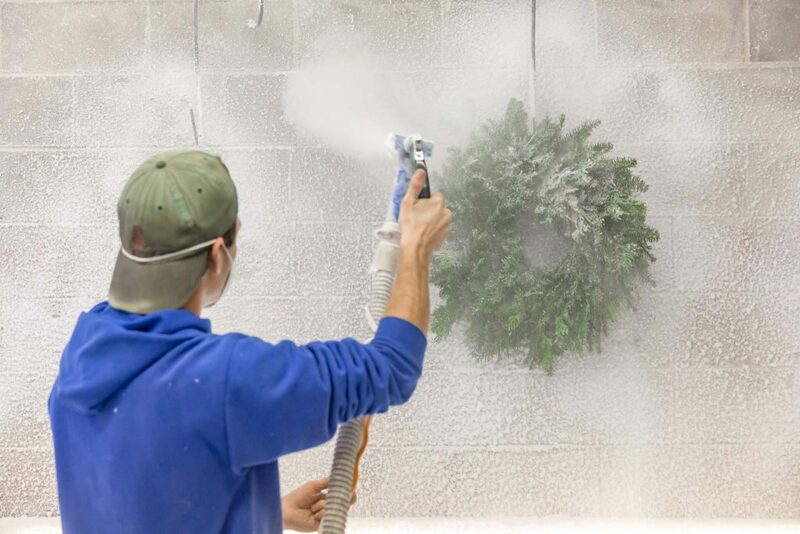 The Christmas trees are flocked with a paint gun. If you don’t want your tree flocked, you can have lights added. 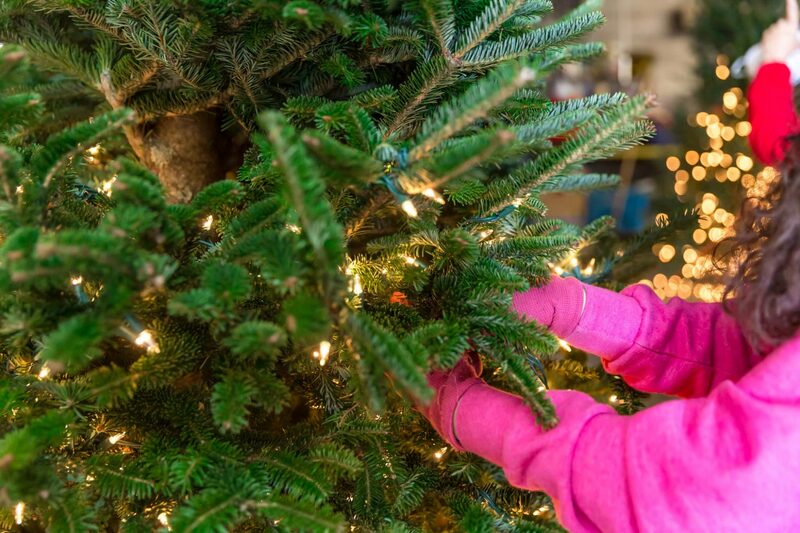 These services are extra options after you pick out your tree. Flocking trees makes them look like they were just cut in the woods that has fresh fallen snow. Carley believes that live Christmas trees give people a sense of family and tradition. However, she says “you have to make the commitment to having a live tree, which means taking care of it.” We discovered from Carley that the secret to keeping a tree alive for the whole season was not what you would expect. 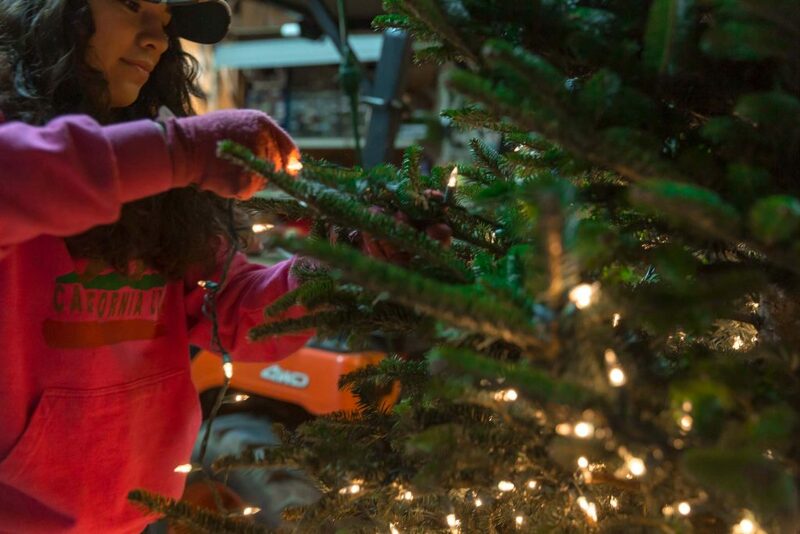 Families keep holiday traditions alive at Pine Hill Farms. Carley suggests that you don’t place your tree in a room where the heating vent is open or place it in a big window with sun from the west or place it in a room with a fireplace or wood burning stove. She also debunked the myths about how to keep a tree alive such as using an aspirin, Sprite or tree food in the tree’s water. Boil water to fill the water bowl. 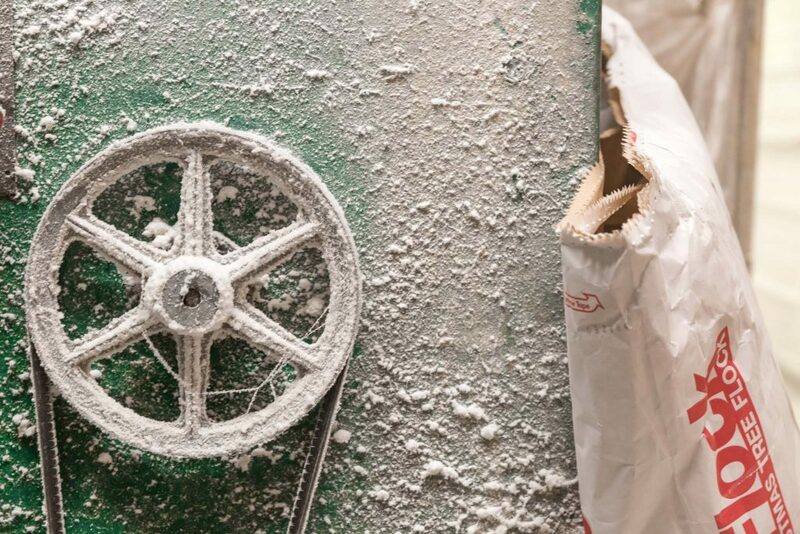 This dissolves any sap that could have formed on the tree trunk. Check the water level everyday to see that it’s covering the bottom of the trunk. If the tree stops taking water, dip all of the water out of the bowl. Refill the bowl with boiling water. It does not hurt and you can use boiling water every time you water your tree. For years on social media there has been a debate over which are better, white or colored lights? To find out the answer we asked the expert which she preferred on her tree? She stated that she prefers white lights, with one exception: “When you put colored lights on a flocked tree, it looks like candy,” she added. We will let you decide what color lights say Christmas to you. Pine Hill Farms grows 5000-7000 trees annually. Looking for live tree this Christmas? We highly you buy your tree at Pine Hill Farms this year. Hats off to the Walkers for being a true example of entrepreneurs who care. 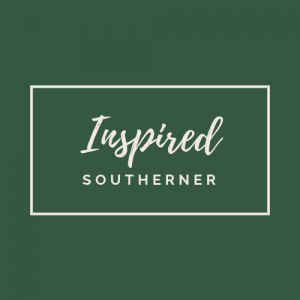 Pine Hill Farms is open daily from 9:00 am – 6:30 pm and is located at 538 Pine Hill Circle in Tarrant, Alabama. All Photos are by Kassady Gibson owner of Focus Creative in Birmingham, Alabama.